This permanent snack bar for Rotterdam's best-known mobile purveyor of French fries consists of a six-metre-high coke can and a stainless steel awning above the sales and frying area. The roof which juts a full five metres is held aloft by two posts. The architecture is inspired by American diners. The can, a Pop-Art artefact à la Claes Oldenburg in itself, contains a space for storage, a toilet plus hand washing facilities and the extract system. 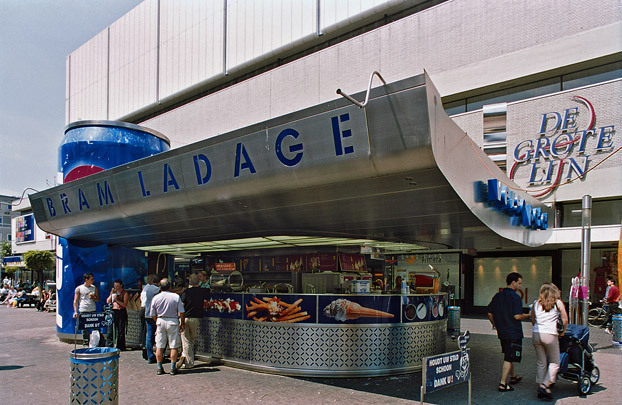 At night when the snack bar closes, a 15-metre-long horizontal roller shutter seals off the sales counter. Mouth-watering photographs of the snacks on offer grace the wainscoting of the sales area.